Vehicle Rating evaluates your performance on each specific vehicle. The first section features an array of top-ranked vehicles in your possession. 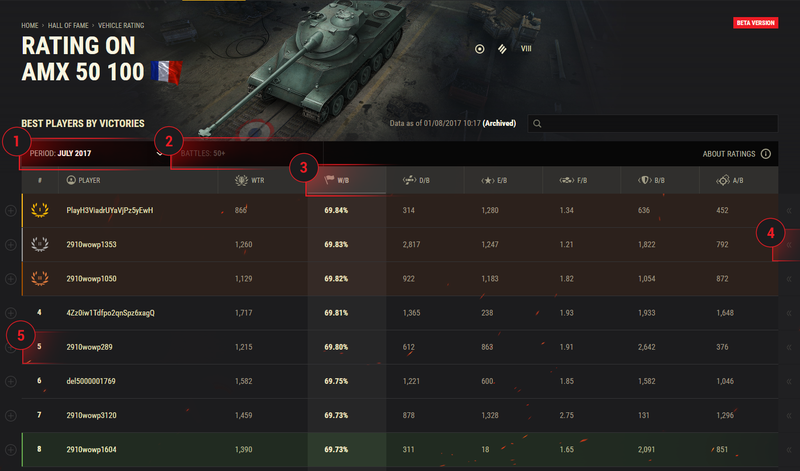 The following three sections present vehicles with the best results and their Top 3 players. If you are among any of these Top 3 ratings, your position in the rating chart is highlighted in green. If not, click the vehicle to view its rating chart with your actual position shown. 1 Time Filter Select from available rating periods: yesterday, a specific month, or all time. 2 Battle Count Filter Select the required number of battles fought. 3 Category Panel Click a category title to view the rating chart in this category. 4 Player Panel Click to view detailed information. 5 Dynamics Index Displays the change to a player’s position over the previous day. The ratings are updated each night. The rating chart displays player results from the previous day. All data from today is included in the ratings tomorrow. Vehicle WTR is a scale created to evaluate your performance on each specific vehicle. The formula for calculating vehicle rating is based on vehicle key stats and contains alpha (α) and beta (β) components. The number of stats used in the WTR calculation can vary depending on a vehicle’s model, type, and role in battle. Each vehicle can have a minimum of 2 and up to 4 key stats. Every stat has a scale, from min stat value up to max, divided into numerous segments. Each segment accommodates an equal number of players within its range. Your stat value on a specific vehicle determines the segment you belong to in relation to other players. For example, if your average Survivability is low, you’ll end up in a low segment of the S scale. At the same time, your DD value is way above average, so you’ll get into a high segment of the DD scale. The coefficient is introduced to even out standard and Premium/promo vehicles with very similar technical characteristics, but different performance statistics among players. Since standard vehicles tend to accumulate a bigger audience of a various skill set, their average performance is quite low. Premium and other kinds of prized vehicles, however, attract a smaller yet more skilled audience; hence, their average performance is higher. The max alpha value is equal to 1. The Survivability stat is not factored into beta calculations.